Flower Girl Dress Ivory ~ Formal Dress ~ Birthday Dress ~ Holiday Dress ~ Juliet Gown ~ customize to match your wedding color palette, birthday party or special event. Contact us with your colors. In Shakespeare's play, it was Juliet who said "What's in a name." 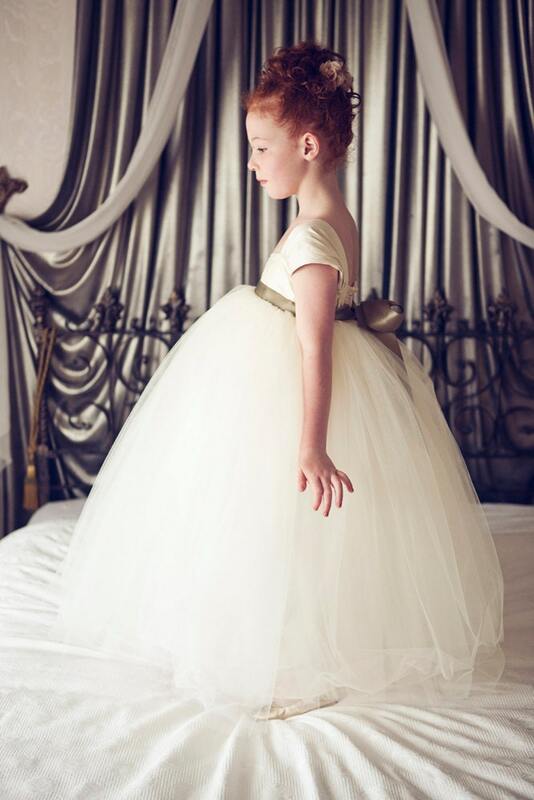 Our JULIET Flower Girl Gown is absolutely breathtaking! *Features a slight sweetheart bodice in dupioni silk with cap sleeves. *The skirt is layered with yards & yards of premium soft tulle. *Back of dress features even more gorgeous tulle for a bustle effect. Perfect for any formal affair! *Dress is lined with no showing seams & tulle does not touch the skin. *Back has stretch for a perfect fit. **Includes one satin ribbon sash in the colors of your choice. Orders currently take 8-10 weeks Before shipment. We do have rush orders available also. Custom colors are taking 10-12 weeks Before shipment. Early ordering is highly recommended. 1. THE SIZE YOU NEED WITH A CURRENT CHEST MEASUREMENT & MEASURE FROM THE TOP OF THE SHOULDER TO THE MID SHIN. OR IF YOU DO FLOOR LENGTH MEASURE TOP OF SHOULDER TO FLOOR. 2. ALSO, PLEASE INCLUDE THE DATE OF YOUR WEDDING OR EVENT. This is the most magnificent flower girl dress I have ever seen. I was in awe when I received the dress! The pictures do not do it justice, it is even more breathtaking in person. It fit my daughter perfectly and it is extremely well made, with many layers of gorgeous soft tulle and a beautiful bodice. It is heavenly and she wore it all day and night and did not want to take it off.